A. PACE stands for Paralegal Advanced Competency Exam®. Professional Examination Service (PES) www.proexam.org assisted in development of the test in which paralegals demonstrate an established level of knowledge, skills, and competency. Q. What does RP® mean? A. RP® is the designation for the paralegal who has successfully passed the PACE® and stands for Registered Paralegal. The designation has been registered with the U.S. Patent and Trademark Office. Q. 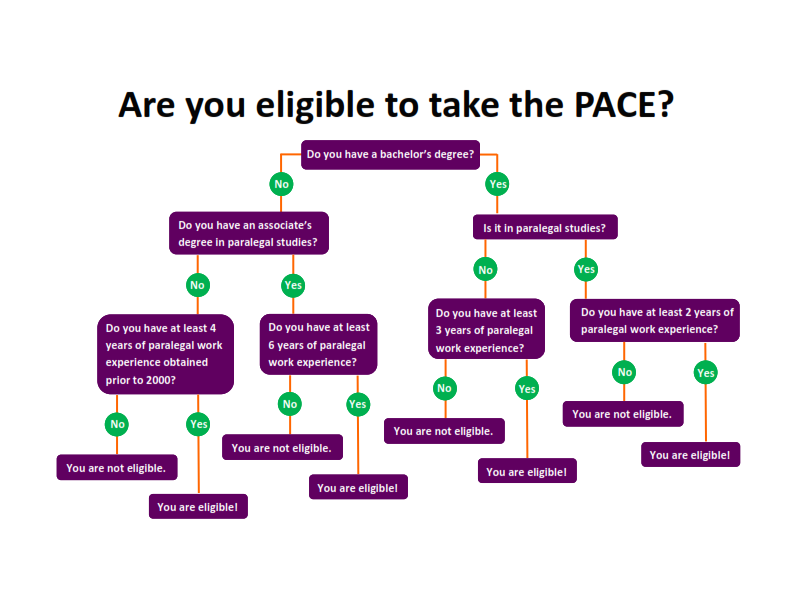 What are the requirements for taking PACE®? A. Because this exam is for experienced paralegals, the requirements are greater and include both experience and education. These can be found in detail on the NFPA® website at www.paralegals.org. Q. My paralegal certificate is not from an ABA approved school. Can I still use it for my PACE® eligibility? Q. I have a felony conviction. Can I still take PACE®? A. The paralegal cannot have been convicted of a felony nor be under suspension, termination, or revocation of a certificate, registration, or license by any entity. Q. I have _ years of experience as a paralegal, but it is all in _____ (insert practice area). Will I be prepared to take PACE®? A. PACE® is an exam for experienced paralegals. It is not uncommon for paralegals who take PACE® to have become specialized in one or more areas. PACE® is not practice specific, so as long as you have studied for the exam, and have a competent working knowledge of the basics of various areas of law, experience in one area should not be a problem. Paralegals who have specialized in one practice area for 20 years or more have passed PACE®. The level of study necessary to pass will depend on the individual’s background and experience, how much of the basics they retained from paralegal school , and various other factors. Many of the questions on PACE are not practice-area specific, but are hypothetical issues testing advanced application of general knowledge, paralegal experience, and critical analysis ability to identify the correct answer. Questions might be posed in a particular type of law practice setting, but the question might really be asking a general question, for example. A. There are 200 multiple choice questions on the exam. Q. Why doesn’t PACE® incorporate a writing section? A. Because of the education component for eligibility to take PACE®, it is presumed that any candidate possesses sufficient writing and language skills to function at an advanced level of a law firm, corporation or entity. There is no need to test writing skills since writing courses are required in virtually every educational institution offering either a 4 year or 2 year degree, or certificate course. In addition, writing skills are tested in the multiple choice questions on the exam. Also, a separate writing section would be subjective to evaluation; ever element of PACE® is objective, and each question is psychometrically sound. We believe that a validated, purely objective exam is more fair to each candidate. Q. How long does the exam last? A. Candidates have up to 4 hours to take the exam. Many candidates finish in less than 2 hours and use the remaining time to double check their answers. Q. What is the best way to study for the test? A. The right answer to this is whatever is the best way for you. Some people study better in groups while others do well studying alone. Some prefer online review courses. Some prefer to use a combination of these methods…it is entirely up to you. Q. Are there any special study materials? A. NFPA® sells a PACE® Study Manual online for $75 (plus S&H). Click here to order the manual directly from NFPA. This is a “must” for preparing for the exam. Be sure you have the latest edition. There is a bibliography in the PACE® Study Manual. The resources listed in the bibliography should be reviewed. Some candidates like to gather additional materials such as flash cards, bar charts, and manuals containing Federal Rules. It is very important that you study the Blue Book for all references to citations. The PACE® Ambassador can also provide you with a suggested list of additional study materials, including electronic study tools like the Quizlet app. Q. How do I join a study group? A. OPA’s Certification Ambassador will help interested persons form study groups. These groups meet on a schedule they set themselves at a mutually agreed location. Typically, study groups are formed at the Certification Workshop in February and then again at the Annual Convention. Please contact the Certification Ambassador for information about connecting with the next study group. Q. Who is the Certification Ambassador? Q. How long does it take to study for the exam? A. That is entirely up to you, but most paralegals who work full time take an average of four to six months to prepare. Q. What online review courses are available? A. Two organizations offer online review courses for the exam: the Advanced Paralegal Institute (API) and the Paralegal Education Group (PEG) each have an NFPA-approved online PACE Review Course. For more information, and/or to register, click here for details of API’s course or click here for details of PEG’s course. More information can be found on NFPA’s website (www.paralegals.org). Q. How do I apply to take PACE? A. The electronic application is available at www.paralegals.org. The PACE examination fee is $250, or $225 for NFPA members. There is also a $25 application fee. Submit your supporting documents as pdfs to the application. These may include: letters of reference, letter(s) from current (and previous, if necessary) employer(s) verifying the required years of paralegal work experience, resume, transcripts, and diploma. Electronic payment will be processed when the application is submitted. Once the completed application and supporting documentation have been received by NFPA headquarters, the payment is processed, qualifications checked and the candidate information is entered in Prometric’s system. After NFPA headquarters receives notice that the candidate information has been accepted by Prometric, an eligibility statement is sent to the candidate by e-mail informing them that they may schedule their appointment with a testing center near them. This series of events generally takes one to two weeks. Q. What does PACE® cover? A. The exam was developed by a professional testing firm in conjunction with an independent task force including paralegals, lawyers, paralegal educators and content specialists from the general public who are legal advocates. It is administered by computer in a proctored testing facility, consists of 200 multiple-choice questions and must be completed in four hours, although many candidates complete it in two. As the utilization of paralegals increases and the roles they play become more varied, the legal profession has come to recognize the Registered Paralegal (RP®) credential as a signal of excellence. Q. Where and how often are the tests administered? Once the eligibility statement is sent, the candidate has 90 days to take the exam. Q. How will I know I passed? A. Upon completion, the preliminary score will be shown immediately. It is important to note that, preliminary results notwithstanding, the RP designation is not awarded until the results of the entire scoring run have been reviewed. NFPA receives the scoring runs quarterly and, pursuant to the procedures established by the Certification Standards Committee, audits 7% of the exam applications prior to mailing the RP® certificates and credential maintenance instructions to the new Registered Paralegals. This stage of the process may take up to a month. NFPA maintains a list of active Registered Paralegals on the NFPA website. List of NFPA Credentialed Paralegals. Q. What if I don’t pass? Q. I graduated from paralegal school and they told me I am Certified Paralegal. Can I use the RP initials after my name? A. If you obtained a paralegal certificate, you are certificated. This is NOT the same as being certified. You can only become certified if you take one of the paralegal certification exams that currently exist (PACE®, the CLA/CP exam or the PP exam offered through NALS. Many people, including some paralegal educators misuse these terms. “RP®” and “PACE Registered®” symbols are registered trademarks owned by NFPA. You may only use these terms after your name if you have passed PACE® and are in good standing with NFPA. Q. How much experience or education do I need to take PACE®? Four (4) years substantive paralegal experience on or before December 31, 2000. Q. I am an RP®, now what? A. Congratulations! In order to maintain the RP® credential, you are required to complete twelve (12) hours of CLE, including one (1) hour of ethics every two years. Please note that your renewal date is the date you took the exam, not the date you received your official notice of passing the exam. You may obtain CLE hours a number of different ways including attending seminars or taking on-line courses. Additionally writing articles, speaking and making presentations can be considered CLE, however you must submit those for approval from the NFPA CLE Coordinator. The renewal process is now electronic and can be found here for NFPA members. Q. I’ve moved or changed employers since my last RP® renewal. What do I need to do? A. You will need to submit a change of address form. This form is available on the NFPA website under the drop down menu for PACE®/PCCE™. Q. I have just realized that I missed my renewal date. Do I have to take PACE® again? May I still use my RP® credential? A. NFPA and the PACE® Standards Committee expect that calendaring of this important renewal date should be automatic for PACE Registered Paralegals. NFPA does recognize that sometimes dates do get missed, and if you are within 60 days of missing your renewal date, NFPA can usually give an extension for good cause. You will need to pay the $25 late fee if your renewal is postmarked after your renewal date. If you are more than 60 days overdue, contact NFPA and they can advise you further, depending upon your situation. Only Registered Paralegals in good standing may use the “RP®” or “PACE Registered®” designations. These marks are registered and are the property of NFPA. Some paralegals negotiate with their employers to pay for the costs of the manual and exam during their annual review. Be sure to let your employer know you have achieved the status so the company directory, business cards, etc. may be updated as appropriate for your firm. Please contact the OPAs Certification Ambassador if you have any other questions at maryvankleeck@yahoo.com.